I'm writing this from San Luis Obispo on the majestic California coast, and I can only wonder in amazement at how far Bixby, my best friend, and I have come in the past two years. We are on the cross-country adventure of a lifetime, having traveled more than 8,500 miles from Maine to Florida, across to Texas, up through Colorado and the Rockies, on to Seattle and down the West Coast. The journey has transformed our lives and allowed us to see America in a way that few have. Bixby, by the way, is a 5-year-old rescue dog. And did I mention that we are traveling by bicycle? How did we get here? In 2011, I was stuck in a tiresome job in Austin, Texas; overweight; a chain smoker; and bored with life. When a friend offered me a Burning Man ticket, I jumped at the opportunity for a change. I quit my job, sold everything that owned me, and decided to live my life like an adventure and less like a chore. After Burning Man, I was inspired to continue my trek into the unknown, and I drove my truck throughout the country, seeing sights, making new friends, and soaking up life. Eventually we ended up in the Ghost Town of Terlingua, Texas, near Big Bend National Park, where my truck broke down. With no money for repairs, I got a job bartending in a saloon, lived for free in a school bus, and ended up staying for a year. 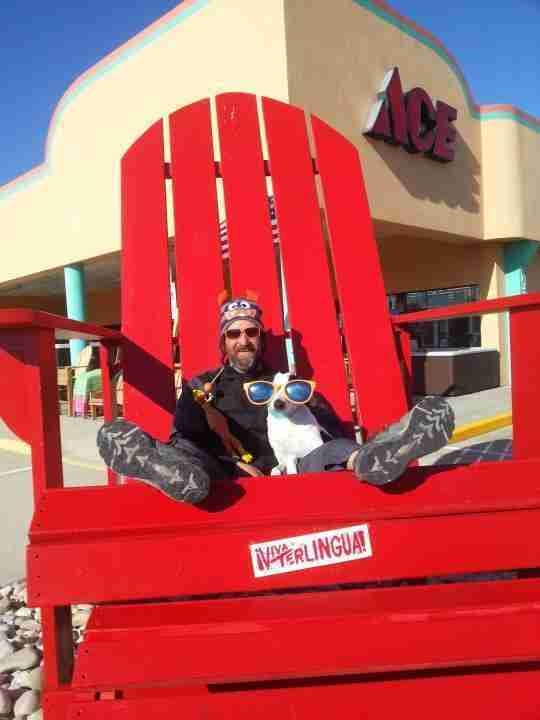 It was in Terlingua that I met two brothers who were bicycling across America making a documentary. Traveling by bike? Free as the wind with no truck or car to gas up and fix? I could do that! 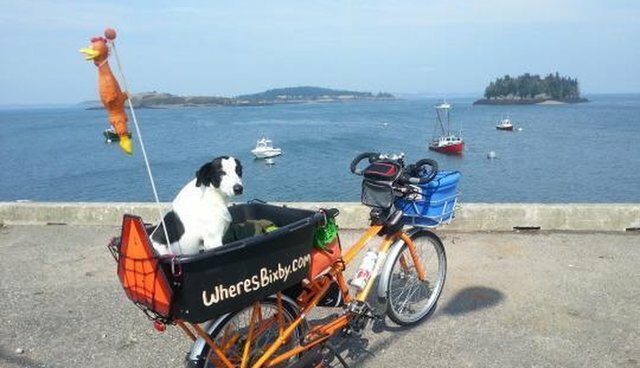 The challenge was finding a bicycle that would allow Bixby to come, too. Salvation came in the form of a Yuba Mundo cargo bike, which has a long, sturdy rack on the back for carrying things. I ditched my cigarettes, fastened a dog crate with comfy bedding and even her very own sleeping bag to the rack, told Bix to jump up, and started pedaling. Accompanying us was Chicken Charlie, our orange rubber safety chicken, who vigilantly watches our back over the many miles we travel. Safety first! On May 15, 2013, we embarked on a 600-mile trip from Texas to Arkansas for a family reunion. 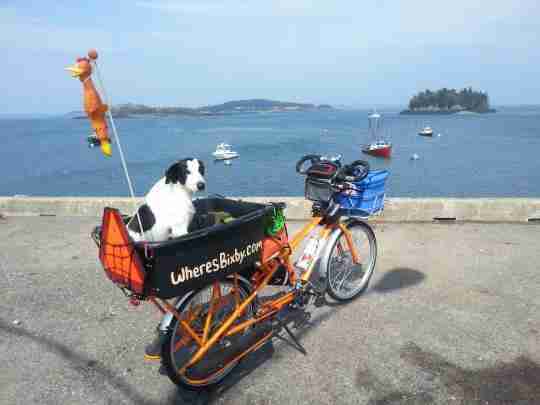 That trip whetted my appetite for more, so Bixby and I secured a ride to the easternmost town in the US, in Maine, and in fall 2013 we began pedaling down the East Coast toward Key West, Florida. 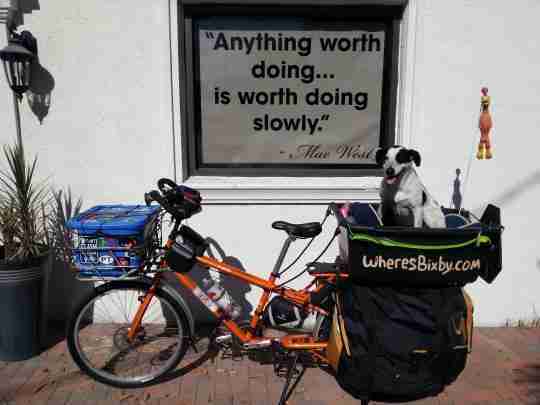 Every town we rode through, people came out to meet and play fetch with Bixby, give us shelter for a night, offer words of encouragement, and congratulate us for living our dreams. In Miami, a local TV reporter interviewed us, and when the story aired as the final "Feel Good" story of 2013, it suddenly made us local celebrities. I appreciated the attention, but I also realized that the media could help me spread a message that I hold dear: promote pet adoption and support local animal shelters, not for-profit "puppy mills." Bixby's companionship has changed my life and made me a better person, and I want to give her the best life possible. There are many more Bixbys searching for love in shelters across the country. Now, having visited 31 states over two years, making countless friends, finding sticks and playing fetch in the most beautiful places in the country, camping out under the stars, and visiting nearly 100 animal shelters, I feel contentment and pride and have learned a lot. 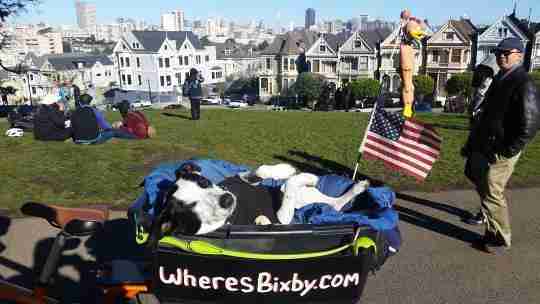 The "Where's Bixby" adventure has been featured in newspapers and TV and radio shows around the world, spurring many dog and cat adoptions. We have pedaled across the Brooklyn Bridge, ridden in a Mardi Gras parade in New Orleans, sung happy birthday to an 81-year-old Willie Nelson in Austin, crossed the famous Bixby Bridge in Big Sur, spent meaningful time with good people all across the United States, and found true purpose in life. I even got a handwritten letter from a 90-year-old Doris Day, one of the original and biggest animal rights activists, as well as Hollywood royalty, thanking me for my cause and encouraging me to continue. At 39, I am much younger than I was before departing. Every day is filled with infinite possibilities. I usually have no idea where we'll end up or where we'll be staying, and that's part of what makes it so exciting. The road ahead is open, and I'm always anxious to see what's around the next bend. After finishing our tour of California, we plan to head back east via Route 66 to see the sights we missed coming the other way. After that, maybe we will head to Europe. Traveling by bicycle is the ultimate way to see the world. And if there's one thing this journey has taught me, it's that your dreams will never come true if you don't chase them. Now my dreams are bigger than ever. I've found my passion. I've found my voice and I've found happiness, all from taking a chance and chasing a dream. One day I will write a children's book about my travels with Bixby. Who knows, Bixby the cartoon? I'm not sure who will play me in the movie, but Bixby will play herself. She's a born actress. 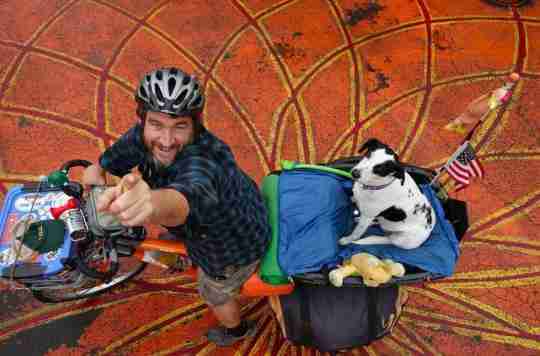 My message to others who are bored and complacent in their lives: Get a bike, adopt a loving pet, and go see the world. There are lots of dogs in shelters waiting for humans to take care of. As Bixby told me all those months back when I was contemplating whether or not I could do this, "Dreams are like sticks - you just have to chase them." You can follow our journey at wheresbixby.com, and on Facebook, Instagram, Twitter, and YouTube.